UPDATE: The results from the latest public engagement action are in! This interactive activity involved 55 total individuals – 22 were community stakeholders and 33 were County residents attending various public events (HT article). 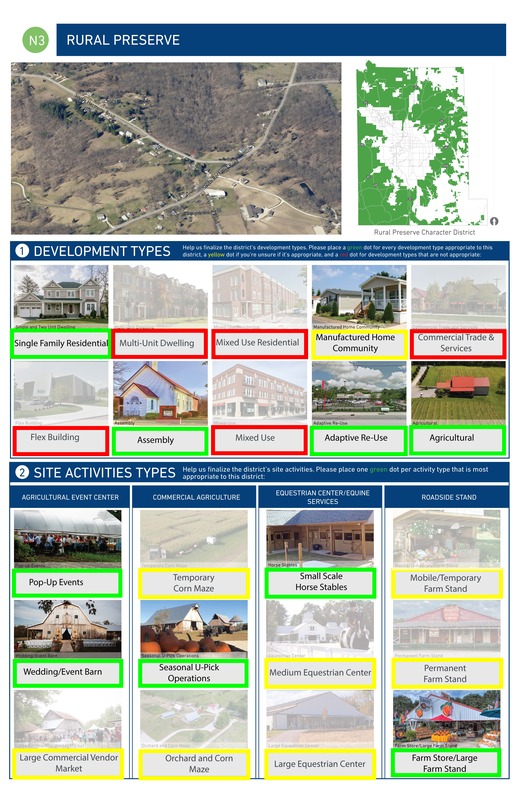 The purpose of the activity was to give participants the option of choosing which development type best fit within different areas of the County (see draft zoning map here). 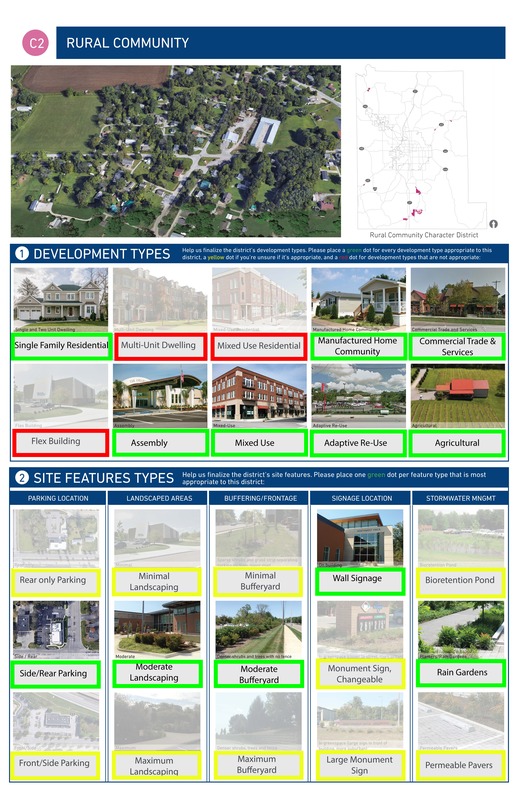 Voters were given green dots to indicate activities or buildings they preferred in an area, yellow dots for activities that they would prefer to require neighbor notice and one public hearing, and red dots for activities or buildings they believe do not fit the character of the area. The results have been combined and are shown in the image attached. These results have been given to the consultants and will directly inform the new code. In addition to a dot voting exercise, County Planning representatives answered questions about individual properties and the general timeline for the County Development Ordinance (CDO) completion (estimated: Spring 2019). 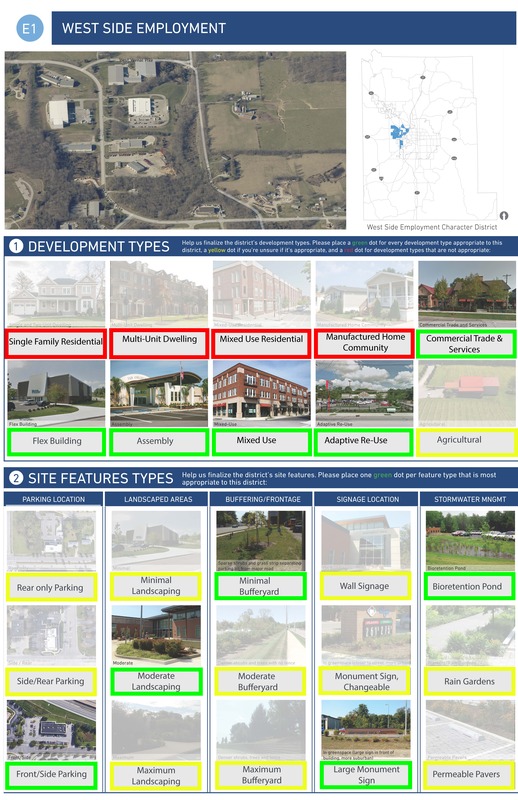 This week’s release of the results from the public engagement begins with properties located in the Community Character Districts. These include: C1 (Community Gateway) and C2 (Rural Community). See the Maps page of our website to see what your property is proposed to be zoned. 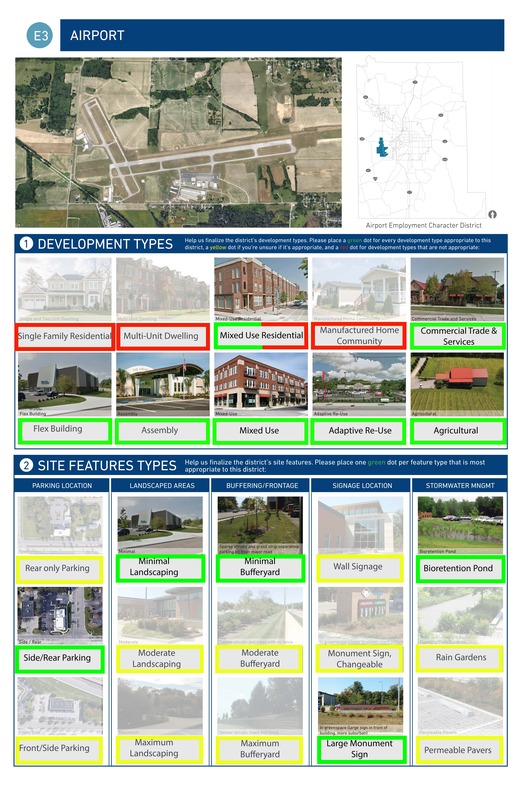 Community Districts (C) are intended to provide a positive first impression with a unique mixture of uses, engaging design, and vibrant connections to urban areas. This week’s release of the results from the public engagement begins with properties located in the Employment Character Districts. These include: E1 (Westside Employment), E2 (South Side Employment), and E3 (Airport Employment). See the Maps page of our website to see what your property is proposed to be zoned. Employment Districts (E) are intended to advance the objectives for continued economic development opportunities. This week’s release begins with properties located in the Neighborhood Character Districts. These include: N1 (Neighborhood Growth), N2 (Conservation Neighborhood), and N3 (Rural Preserve). See the Maps page of our website to see what your property is proposed to be zoned. Neighborhood Districts (N) are intended to accommodate a wide variety of primarily residential uses, housing types, densities and neighborhood development contexts. 1. What does a “County Development Ordinance” mean? 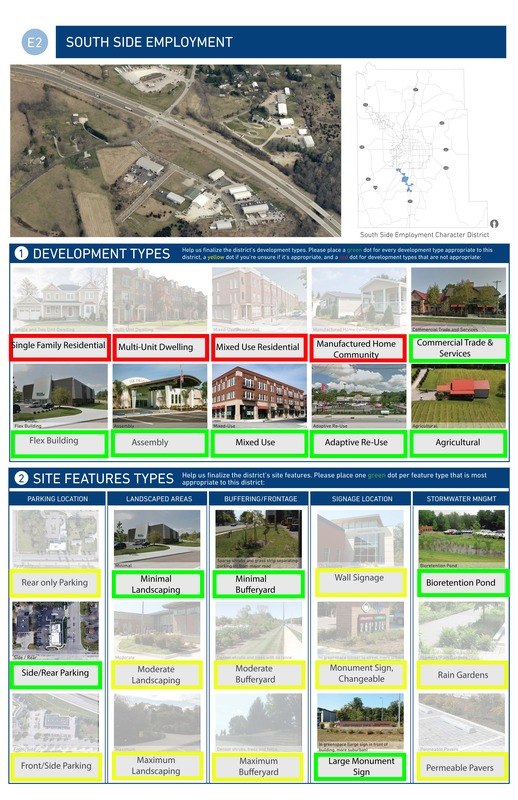 Monroe County adopted a county-wide 20-year Comprehensive Plan in February 2012, and subsequent amendments to the plan in the form of an Urbanizing Area Plan in 2015 and a Framework Zoning Plan and Code Diagnostic in December 2016. 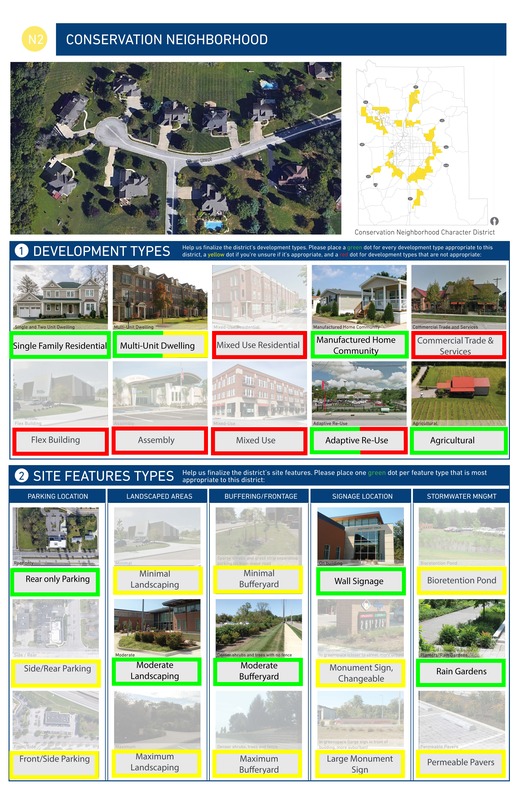 We are now implementing a strategy to rewrite the Zoning and Subdivision Ordinance for consistency with these adopted Plans; this will create a County Development Ordinance or CDO. The last complete rewriting of the zoning regulations was in 1997. 2. Who are the consultants creating the CDO? Calfee Zoning and MKSK are the two consultant teams working on the CDO. 3. I live in Monroe County – outside of the City of Bloomington, Town of Ellettsville, and the Town of Stinesville. How will this plan impact my property? Monroe County, Indiana, is governed under Title 8 of the Monroe County Code, which includes zoning for all properties in the unincorporated areas of the County. Currently there are 41 zones in Monroe County; to simplify and update the code, the Planning Department is working with a consultant team to consolidate this into 4 major character districts. As a result, your property will be rezoned. Many of the properties further away from the City of Bloomington will not experience a shift in the allowable uses and the zoning will likely be comparable to what is in place today. Go here to see what your property is zoned currently, and call the Planning Department to help answer questions you may have. 4. How is this different than the current ordinance? The current zoning ordinance works by allowing certain uses in certain zones. The future CDO wants to change this by using a development type table to determine where a particular activity fits instead of focusing on defining all possible uses in the County. The subdivision ordinance is currently separate from the zoning code. This CDO will combine the chapters into one cohesive document. 5. What is a development type? 6. Would I be able to subdivide my property? The subdivision control ordinance will be altered in the CDO. However, many subdivision requirements – like access to sewer service – will still be drivers for density. 7. How will this Plan take into account the prior City of Bloomington’s annexation proposal? In 2017, Mayor John Hamilton proposed annexation of the unincorporated areas surrounding the City of Bloomington. The Planning Department and the Consultants will review parcels closest to the City to be zoned in a way that is compatible with the City’s upcoming Unified Development Ordinance (UDO). Should there be a future annexation proposal, this will reduce the potential land use changes to those property owners in the future. 8. How does this differ from the City of Bloomington’s Unified Development Ordinance (UDO)? Will the City and County be working together? The City of Bloomington is going through a similar process to update their zoning code, but they are calling it the ‘Unified Development Ordinance.’ The Consultants for the City, Clarion Associates, and Consultants for the County, Calfee Zoning and MKSK, will work together as the zoning maps are being finalized to ensure compatible zones around the City/County border. 9. What is the timeline for completing the CDO? The anticipated completion date for the ordinance adoption process is Spring 2019. 10. Where can I find how my property will be rezoned? Zoning of land is a practice that assigns allowable uses to different pieces of land, based on the location, availability of infrastructure, and environmental conditions. 12. What are the goals with this new CDO? A full list of the goals are on our home page. 13. How many zones are there currently? How many will there be under the new CDO? There are 41 zones currently; the CDO will reduce this number to around 10 zones. Changes may be made by the public and Plan Commission, so this number may change over time. 14. What if I went through a rezone, variance, or conditional use for my property? 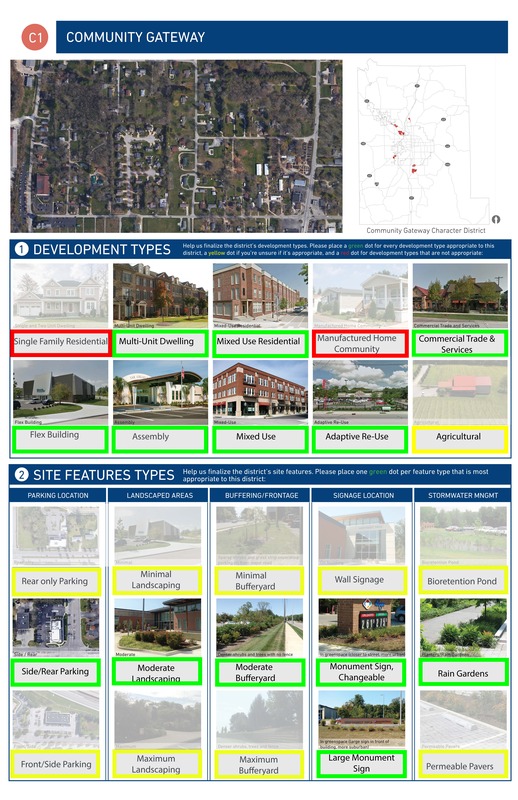 Assuming that the property is currently vacant and the rezone, variance, or conditional use is no longer compatible with the CDO zoning, a property owner would need to be vested under Indiana State Law to maintain the use granted under today’s code. Vesting is determined on a case-by-case basis – if you are in this situation, we recommend that you contact the Planning Department (812)-349-2560. 15. What can I do now if I want to get involved? How can I receive regular updates about what the CDO? Sign up for our email list and follow us on Facebook to receive regular updates. We are going to be doing a variety of public input surveys, a public open house, public hearings, and more. Stay tuned and feel free to call the Planning Department to learn more about your future opportunities on your property (812)-349-2560. 16. Will my structures/uses be “grandfathered” in if they do not fit the new standards? Current structures/uses that are legal under today’s zoning code would be grandfathered if they do not conform to the new CDO. However, existing structures that were not built legally, or sites developed without prior approvals, would not be grandfathered under the new code. If you have questions you should call the Planning Department (812)-349-2560. We will be making every effort to accommodate all legal, existing activities. 17. Will I be notified when this happens? Yes, you will receive notice of the public hearing before your property is officially rezoned. The notice will include what the new zoning will be for the property. 18. What is a building typology? A building typology refers to a building’s orientation and architecture as it relates to the street. The intent of a building typology is to provide a general understanding of typical building form, lot layout, scale, and character. 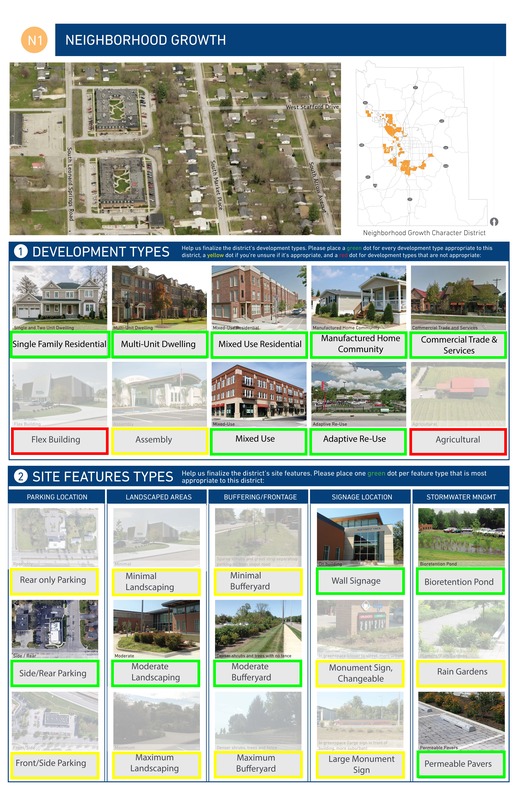 The typologies are illustrated in Phase II of the Urbanizing Area Plan, which provides a framework for the CDO. We need to hear from residents about what opportunities you would like to see in your community! Check this page for a series of online surveys, social media updates, and notifications on public meetings. The project consultants and the Monroe County Planning Department want to make sure the new ordinance protects the resources and rights of residents to enjoy their property, while also building in the flexibility for people to create new jobs and other opportunities for the community to thrive. What would you like to see in Monroe County that is not here already, and what would you like to see less of in the County? These are questions we need answered to inform our new code.